In this article, learn more about ammunition resources for Desert Tech Rifles. We frequently get questions about feeding your Desert Tech rifles. It would be a disservice to our customers to not tell them about our sister company Desert Tech Munitions, and the premium ammunition available from DTM. What kind of ammunition works best, and what should you stay away from? We opened our own ammunition line for a good reason, we wanted to provide the best option for our customers. A rifle is only as good as the ammunition it shoots, and we wanted to make sure that we offered ammunition that was specifically optimized for our rifles. Desert Tech Munitions are manufactured to precise standards that are specifically tailored to our line of Desert Tech rifles. While the ammunition functions well in any firearm, they are specially designed to produce the best performance with Desert Tech rifles. Desert Tech rifles come with a 1/2 MOA guarantee, and there is no better way to achieve that performance than shooting Desert Tech Munitions. Steel cased, corrosive, surplus, improper, or hand loaded ammunition are not recommended for use in Desert Tech rifles and could void your warranty. Only quality ammunition should be used in your rifle, and from reputable sources. This will ensure years of safe and repeatable performance. 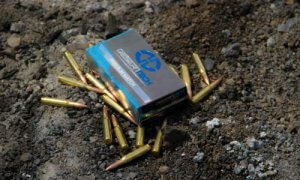 There are other manufacturers of ammunition that also make great ammunition that works well in your Desert Tech rifle. If you have an SRS A1 with a 308 Win conversion kit, most of the popular and well known brands of match ammunition will give you great performance. We have experienced this with Federal Gold Medal Match in both 168 and 175 grain options. We have also seen great accuracy from Hornady match ammunition, particularly the TAP and Black product lines. If your SRSA1 or Covert has a 338Lapua Magnum conversion kit, there are also an abundance of good options to shoot. Besides the DTM ammunition, Lapua makes an impressive load that performs very well in Desert Tech rifles. Another good choice is the ammunition made by Ruag and Norma. The 6.5Creedmoor is becoming very popular, and if the DTM ammunition is not your choice, then there are also great options for your SRS A1 available from Hornady and Prime both of which give great performance and accuracy. If you are more of a 260 guy than 6.5 Creedmoor, there are still many options for great ammunition for the 260 Remington. As usual, some of the best performers come from Federal , Hornady and ABM. Another still popular cartridge is the 6.5X47 Lapua, and as you can imagine, Lapua makes a great choice when shooting the X47. Another popular conversion kit for the SRS A1 is the 300 Win Mag. Which does very well shooting the Hornady 195’s though it does show preference to the 220 Grain Sierra Match King. If you own a Desert Tech HTI, the right ammunition is even more important. Because when you are shooting cartridges that costs anywhere from five to ten dollars per shot, you definitely want to make sure they shoot well. If you have a 50BMG, you are probably already aware of the multitude of surplus and other inexpensive options that are available. Unfortunately, these are not performance based munitions and usually reflect that with very poor shooting performance in your rifle. We recommend only shooting match grade ammunition through your HTI, regardless of caliber. 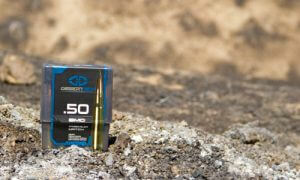 Desert Tech Munitions manufactures the best 50BMG ammunition for your HTI. Using the 750 AMAX from Hornady, we have loaded it to give the HTI the best accuracy and ballistic advantage possible. All while delivering heavy energy payloads far downrange. The only other suitable ammunition we have used for the HTI 50BMG is made by Hornady, and the 50BMG ammunition they manufacture is also a good choice for HTI fuel. The wildly popular 375CT takes the HTI to its maximum limits. Getting there requires the best ammunition you can buy, and Desert Tech Munitions manufactures it specifically for the HTI. Using the best lathe turned solids from Cutting Edge Bullets the 375CT ammunition we manufacture will give you the legendary downrange accuracy that the HTI is known for. The 408CT while less popular, still can carry incredible energy to the target. 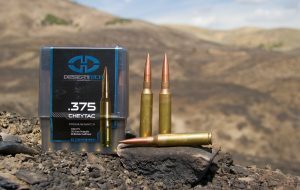 There are very few suppliers of ammunition for it, the only large commercial offering is from Cheytac USA, though there are a few custom shops that also produce it. The 416 Barrett, much like the 408CT is a less popular cartridge, and the only manufacturer of it currently is Barrett ammunition. Every rifle is a little bit different, and your results may vary. But if you stay with well known quality brands, you will likely have good results. As always, feel free to contact us if your are having trouble getting accuracy from your Desert Tech rifle.